UPDATED 9/14/15! We returned to NLB for an amazing breakfast! See the new content below! 1. We don’t camp out weeks in advance of an opening. 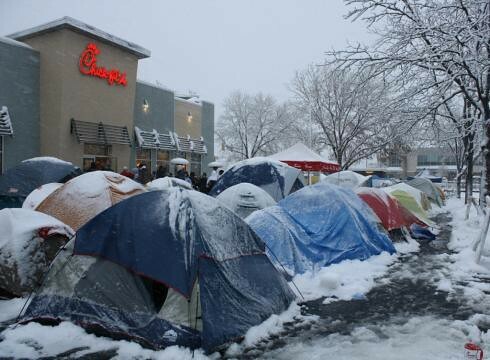 And, while I would never be one of the schmucks in a $20 Coleman tent sleeping on a sidewalk outside some vegan Chick-Fil-A, the concept of it is appealing. I mean, how committed do you need to be to artery-clogging, fat soaked food to actually sleep outside for a week? That is true, foodie commitment. Camping in the winter for a week. For fried chicken. 2. We can’t just have a greasy, bad-for-you burger experience. 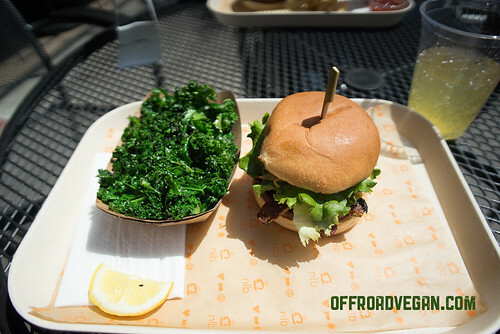 Most vegan burgers I have seen are typically some malted oregano-kale infused, carrot fiber burger, promising all kinds of health claims. Sometimes, I just want to eat something bad for me too. 3. 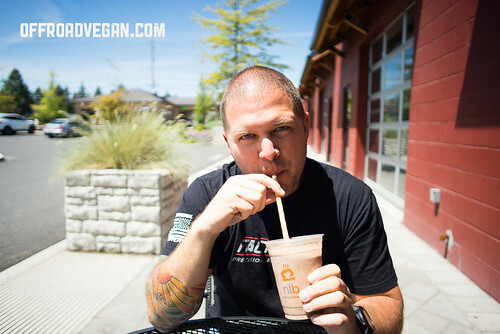 We don’t have a vegan fast food mecca that beckons us to make multi-mile journeys off major interstates. 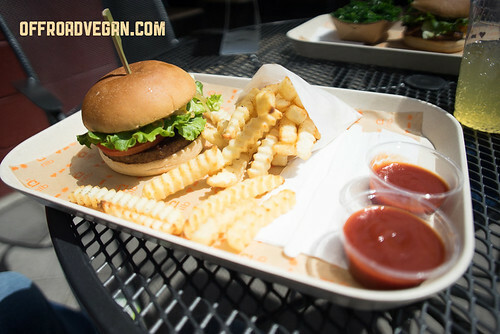 We need a vegan In-and-Out kinda place. 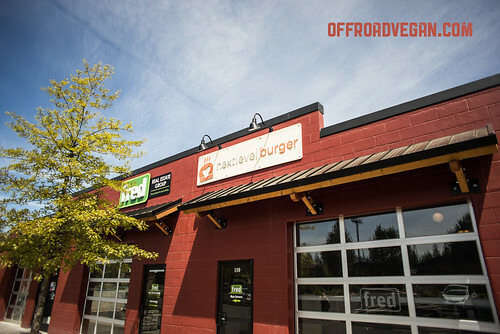 So when I heard there was a new vegan burger joint in Bend, I had a chance to do a little of all three. Next Level Burger’s menu looked like a promising entrant into the “bad for you burger experience.” I know that sounds like some weird gastro-Disney amusement ride, but I was actually excited. So, while I could not camp outside for a week, we did the next best thing – brave the Highway 26 Memorial Day traffic for a day trip to Bend, just to check this place out. A huge menu that even includes breakfast! I was so excited, I actually drove right by the place and had to turn around. Next Level Burger is located in a cozy strip-building that also houses a coffee roaster, bar, and a couple other Bend-ish businesses. The space is airy, and bright, and on the sunny day we arrived the front garage door was open giving it a great light. The place is immaculate. A nice spot for a great lunch. The second thing I noticed were all the nutritional “facts” posted all over the walls. While I felt this might turn into another malted oregano-kale fused burger experience, I remained positive. I ordered the Next Level Burger, which is the idyllic burger – basic with lettuce, toms, ketchup, mustard and pickles. I was surprised, also when my “animal style” comment I joked about was actually something they would do. So, I naturally ordered it “animal style.” I also chose crinkle fries as a side. The burger arrived in a magnificent style, on a tray with liner that reminded me that I might actually be in that “bad for you” burger experience I was after. The burger surely looked the role, and the fries promised some great flavor. I was not disappointed. My girlfriend went with the All American burger + grilled onions. The burger was perfectly cooked, and was a very close meaty analog. The flavor was excellent, and the ketchup/mustard/secret animal sauce oozed out of every bite. I needed a bib. The fries, too were crispy and hot and great. One thing I was pleasantly surprised about was the soda selection. 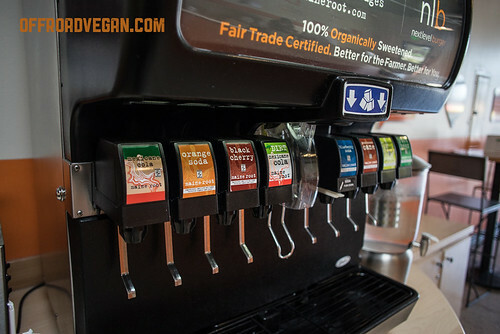 I am not a huge soda drinker, but they offer all natural Maine Root, fountain sodas! The same company that makes one of my favorite root beers also makes orange, lemon lime, cola, and a bunch others!? Awesome. They also have a great selection of local beers and ciders. The service here was super friendly, and willing to help me navigate the significant menu. One thing that really impressed me was that there was no trash can – literally everything on my tray went right into the compost bin. They have clearly done their homework and got all As. After licking my fingers clean, I had one final decision to make, and that was what milkshake to order. (**DISCLAIMER: I did not eat breakfast this day, because I knew I was coming to Next Level Burger…I am usually not such a glutton). I opted for the cookies and cream with soy milk and a little chocolate sauce. I was amazing. I actually could not even finish it, a guilt that remains with me to this day. Two shakes! 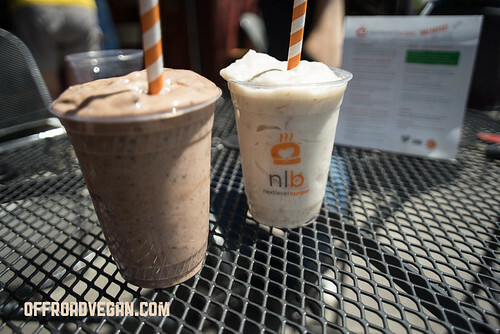 Chocolate cookies n cream, and a Banana shake! With a full belly, a light sunburn, and a huge smile on my face there was only one more epiphany for me to have. The food here is actually not all that bad for you! I was happy about that and at the same time, a little confused. How can something that so well mimics the missing fast food experience of my pre-vegan days also be relatively good for you? How did NLB pull this off without a menu full of quinoa-kale infused burgers? The answer is not really all that important, but something to consider. 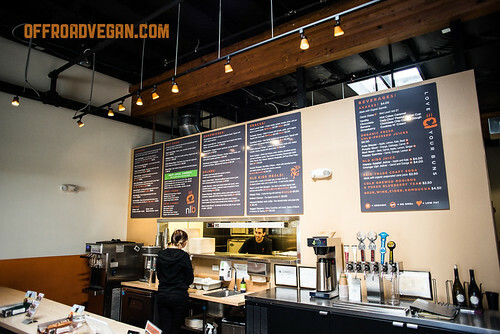 You can now go to a great place, order great vegan food, and leave without fearing a triple bypass in your near future. I mean, what is not to love? Just leave your Coleman tent at home, head to Bend, and get some next level shiz. For realz. PS: Guess what is even better than this NLB? How about one right in Portland!? Looks like they are taking over the Pita Pit on Hawthorne! Follow ’em on the book of Faces for updates and to give them some love. UPDATE! Last weekend we returned to Bend for the required visit to NLB. This time though it was breakfast we were seeking. I had a tough time deciding between sweet or savory so with the server’s recommendation I ordered the pancakes AND the Bacon Benny sammich. She said I could always take home whatever I didn’t eat, so somehow I felt like less of a pig. Pancakes sent direct from the heavenly gates. 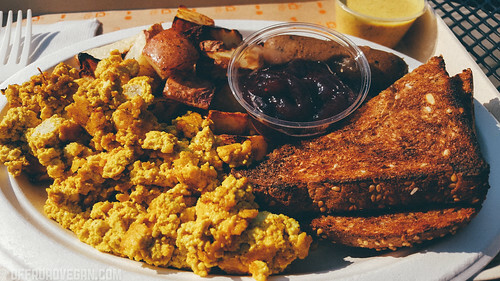 Kristin ordered the New American Plate (with the tofu scramble and link sausage options). The pancakes are the frickin bomb and came out steaming hot with melted vegan butter and agave syrup. There were hints of cinnamon in the cakes and they were cooked to perfection. 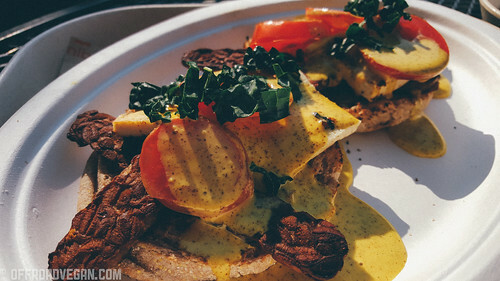 I am really glad I actually got the fatty version of breakfast though as the bacon benny (while also delicious) was a little on the lighter side for this vegan’s brunch. Kristin and I shared them both. 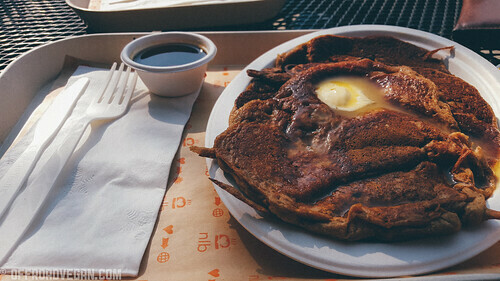 I look forward to many breakfasts there in the future – but avoiding those pancakes will be pretty darn tough. Previous PostRestaurant Review: Gracias Madre [San Francisco]Next PostWhat if I was Deserted on a Tropical Island?